McLeod Cardiologist Dr. Dennis Lang presented on women and heart disease during the Red Heart Healthy Luncheon held at Hampton’s Restaurant in Sumter. McLeod Heart and Vascular Institute physicians from around the region helped McLeod celebrate national Go Red for Women day on February 1, a day established by the American Heart Association to raise awareness of the number one killer of women. 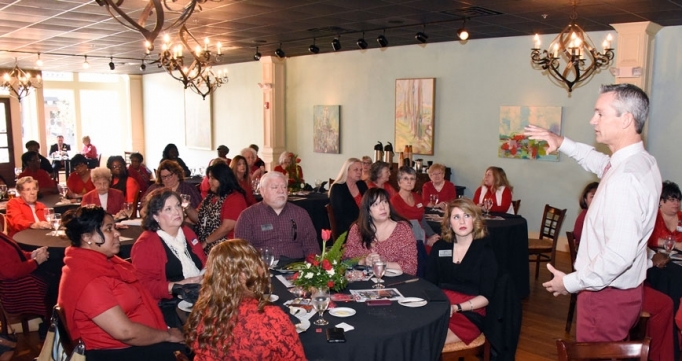 More than 545 women attended educational presentations on Women and Heart Disease during free Red Heart Healthy events in Florence, Cheraw, Dillon, Hartsville, Little River, Loris, Manning, Myrtle Beach, and Sumter as well as during a breakfast for the McLeod Angels in Florence. Speakers at these events included Dr. Vaishali Swami, Dr. Nicolette Naso, Dr. Wayne Holley, Dr. Christopher Cunningham, Dr. John Patton, Dr. Eva Rzucidlo, Dr. Ryan Garbalosa and Dr. Dennis Lang and Nurse Practitioner Sarah Norris.